Dr. Ryan Christensen, DO, is thrilled to be joining OHCA as a full-time physician with Dr. Patterson. Originally hailing from Montana, Dr. Christensen attended A.T. Still University- School of Medicine in Arizona graduating in 2012 and completed his clinical training in Seattle, WA. He came to Michigan, and completed a combined residency in osteopathic family and emergency medicine at McLaren Oakland Hospital in Pontiac, Michigan. 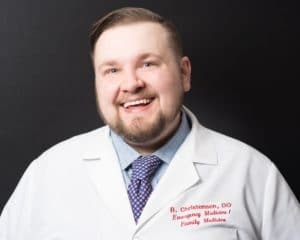 Dr. Christensen serves on the board of the Oakland County Osteopathic Medical Association and is the past chair of Michigan Osteopathic Association Council of Interns and Residents and served as Chief Resident in Family Medicine at McLaren Oakland Hospital. His clinical interests include full-spectrum family medicine and osteopathic manipulation for all ages, including infants. He enjoys treating complex musculoskeletal syndromes and myofascial pain and is especially proficient in cranial osteopathic manipulation. Dr. Christensen in board-certified in Family Medicine and OMT and board-eligible in Emergency Medicine. He enjoys playing music, his two cats & corgi, technology, and travel. 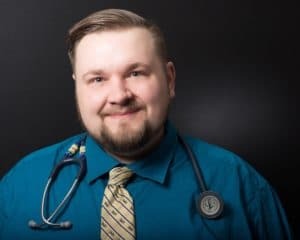 Dr. Ryan Christensen completed a ﬁve year dual residency in Family Medicine and Emergency Medicine at McLaren Oakland Hospital in Pontiac, MI. He is board-certiﬁed in Family Medicine and OMT with a special focus on cranial manipulation and is board-eligible in emergency medicine. Dr. Christensen will provide primary care and osteopathic manipulation for all ages, and has a passion for treating musculoskeletal complaints and diﬃcult pain syndromes. He is honored to join the OHCA Family! Dr. Christensen is passionate about helping you find health. Call now to schedule your appointment! Now accepting new patients! Fill out the form below for a call back from one of our office staff to schedule your appointment. If you need a same day appointment, please give us a call at 586.221.2791. New patient? Download forms here and bring them to your appointment with you. © Osteopathic Health Care Associates. All Rights Reserved. Powered by Ponder Consulting ®.